Have you ever tried to move multiple selected objects, only to have them go everywhere except where you wanted them to? 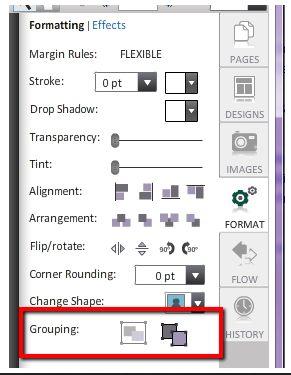 Grouping elements in Page Designer allows you to move, resize, flip and rotate numerous elements together. You will be able to easily maintain the designs you have created. With the objects selected, click the Grouping button. When elements are grouped together, they can be moved as one object. You will see dashed lines around each object in the Grouping. You will need to ungroup elements to edit text. TIP: This is a great feature to use when moving Portrait pictures and their text boxes. Group an entire row or column once they are properly aligned. Making customized Portrait Templates just got super easy!